We've worked with interior designers from around the world on a range of custom wallpaper projects. When a designer comprehends exactly how varied and valuable our custom wallpaper services are, we're able to forge successful creative partnerships that are a huge benefit to the end client. Case in point: We were commissioned by Tom Scheerer Incorporated to create custom wall murals from a print that his client owned. The murals were to be installed in an East Hampton Cottage. To keep the scenic mural in keeping with the bright and clean surroundings, the print was adjusted with a subtle haze to give the wallpaper a subdued, sublime look. The mural was printed onto artist canvas that may be used as an interior wallcovering. The displayed photo shows the result, a perfect combination of simplicity and color. While oftentimes our custom wallpaper is used to take a room over the top, here is a great example of how a custom mural can take a step back to be part of the supporting cast as opposed to the star of a room. 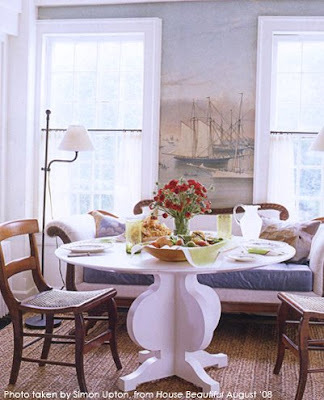 The work that Tom Scheerer and his associates completed was so noteworthy that the cottage was featured in the August '08 issue of House Beautiful, read the article here. The image that was used to create the custom wall murals is not ours to re-sell, but the look can be successfully achieved nonetheless. Tom Scheerer not only specializes in understated beach chic, but more upscale metropolitan abodes as well. Follow the link to his website above, and contact us to learn more about using a custom wallpaper project to enhance your space.